–>> Here we go, wrapping up this break-down of the “History- ” set with 1 final installment.. I mostly use the “Paramount Movie” tag to distinguish the 2014 movie reboot from the original films. Not that it’s hard to do that. My “tOkKustom” repaint of the standard carded Leo figure was to heighten the details of the Varner sculpt, not necessarily to go for hyper-detailed movie accuracy. It suffices i suppose. The two noggins on the toy seem slightly different. But i highly suspect a manufacturing issue on that note. ..here’s lotsa Movie Leo figures, for fun. 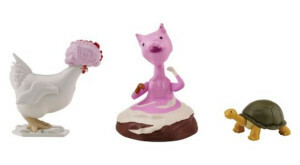 Were you lucky enough to find this set under your tree last month ?? 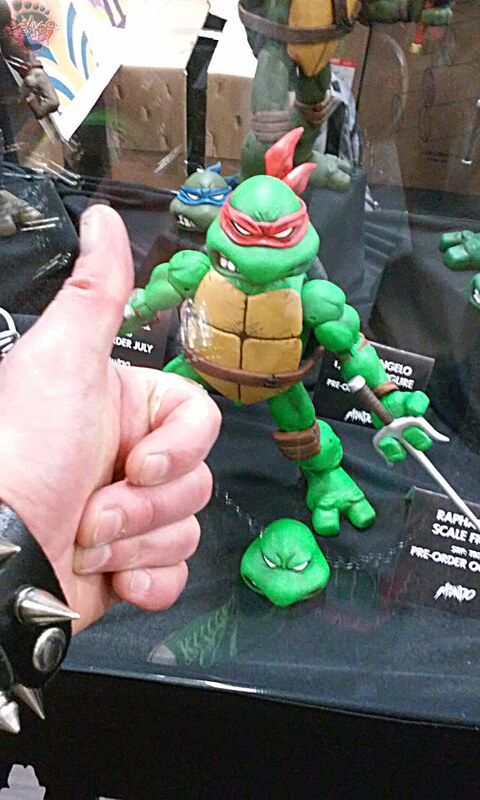 White Foot Soldier ::The Last Mondo Turtle: Raphael Tuesday 1/19 **THAT’S TODAY !! !! 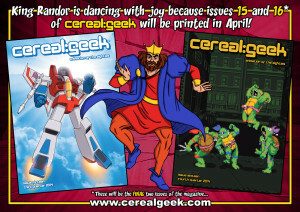 You better check it out on MONDO’S SITE to see NON-SUBSCRIPTION STATUS !! 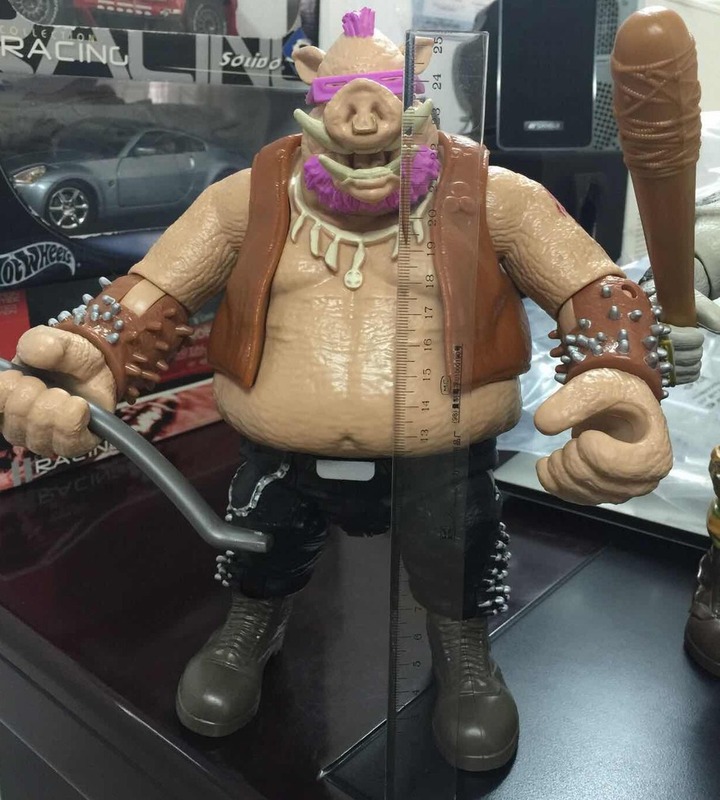 FIGURAS TAMAÑO 11 PULGADAS DEL FILM FUERA DE LAS SOMBRAS , T-drome’s DVD gives us another peek at movie 2 toys with the 11″ scale teens, Bebop & Rocksteady. 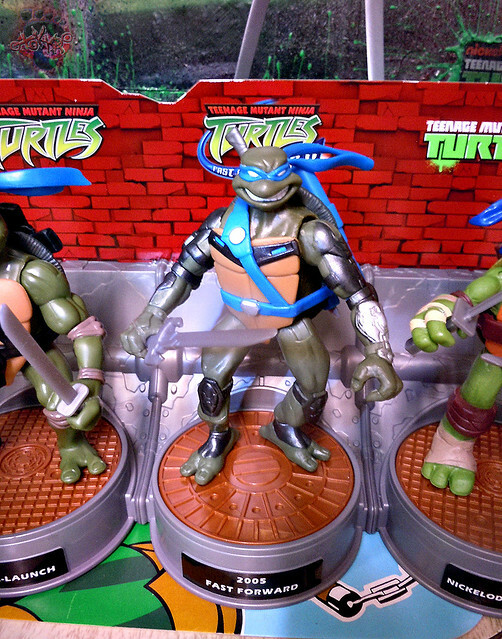 I do not know if one should be satisfied or already tired of each new line Trading coming out of the Ninja Turtles, the fact is that Jakks Pacific, maker of figures 30 or so centimeters high, [they] announced that among its new lines, the figures will [be] Ninja Turtles. 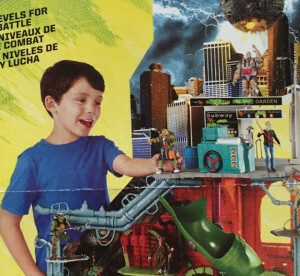 No news yet on what version were based [on] … It was not until the next info [at] NEW YORK TOY FAIR. 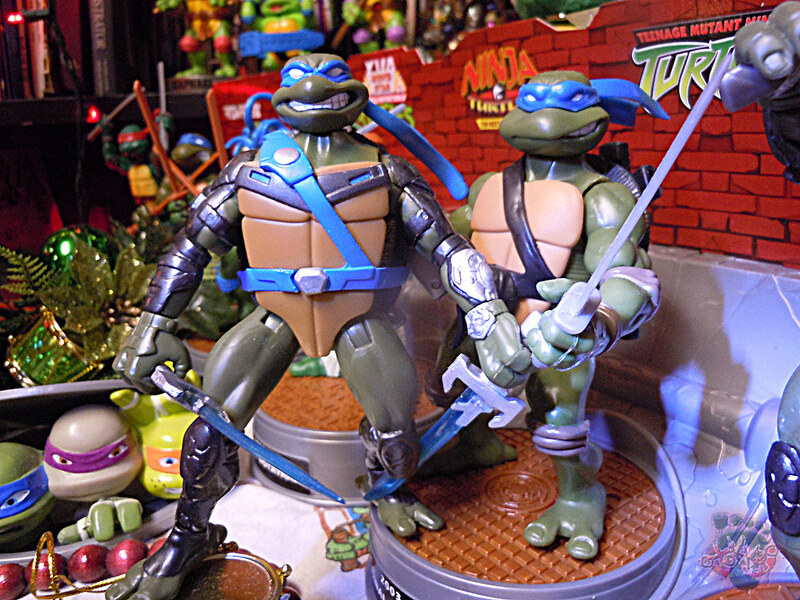 ..bottom line, aside from the Giant KID-SIZED TMNT figures we’ve seen during the Holidays from JAKKS ( Mikey and Leo so far ) – – we may see other scale figs. Jakks has been putting out larger Nintendo, ZELDA, MARIO, STAR WARS, WWE, HALO and the like. 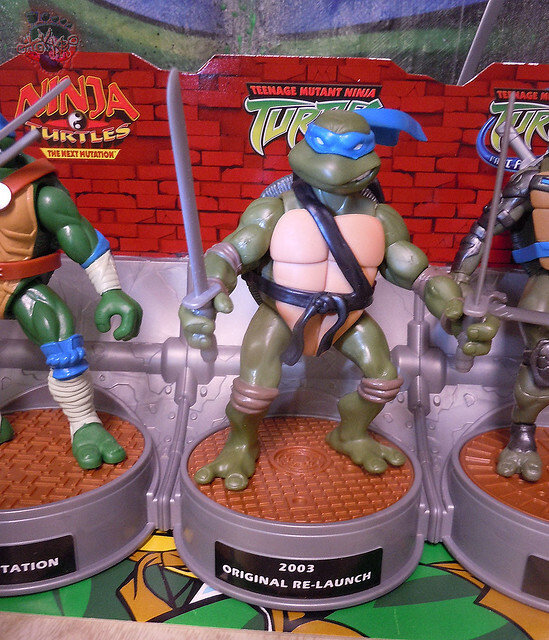 There may be another scale offered by Jakks akin to those other franchise lines. We’ll see. NY TOY FAIR is around the corner. ABRIL ES EL MES DE LA APRECIACIÓN DEL ARTE. 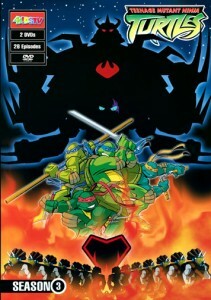 ; IDW TMNT # 57 Art appreciation variant cover. TOYZMAG:: French toy news – Les nouveautés 2016 chez Funko : Playmobil, POP!, Fabrikations, Dorbz, MyMoji; Funko’s Playmobil, POP!, Fabrikations, Dobz, MyMoji, & PLAYMOBIL offerings !! Striking new things continue to pour out of Funko including the cute MyMoji blind assortment and a collaboration with the legendary PLAYMOBIL line. –>> Down to two more in this set, for part 7 of the “History- ” set, Nick’s own Ciro Nieli LEONARDO from 2012 appears.This guy translates alright, but again is not without a tiny bit of modification. The most notable mod is in the bigger whites of his EYES. 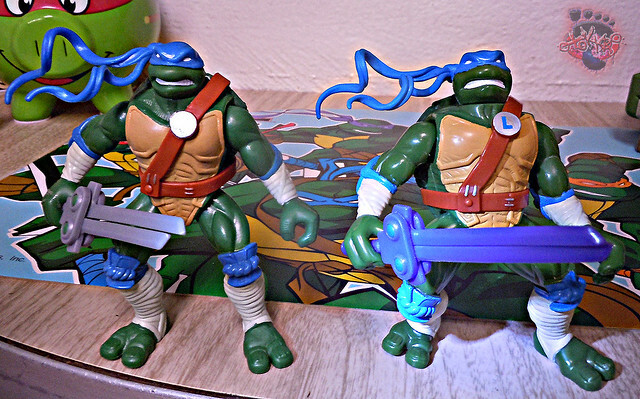 The change from the smaller molded eyes of the original 2012 also appears on carded retail 2015- reissues of that standard Leo Nick toy. The explanation prolly lies in another budget issue with Playmates and a small money saving tactic. 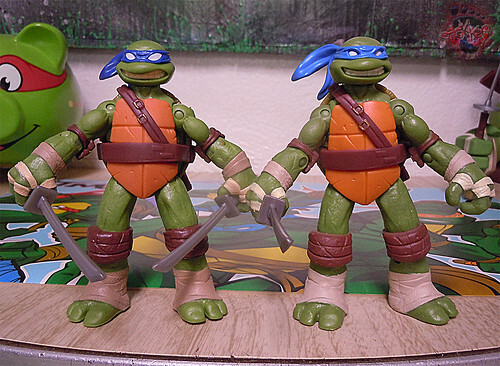 A “throwback” variant of the same sculpts of the 2012 first wave of Turtles with “retro” colored knee/elbow pads, initials on their belts like the classic ’88 Turtle toys, and show accurate pupils that replace the “WHITE” blank eyes of that initial wave. 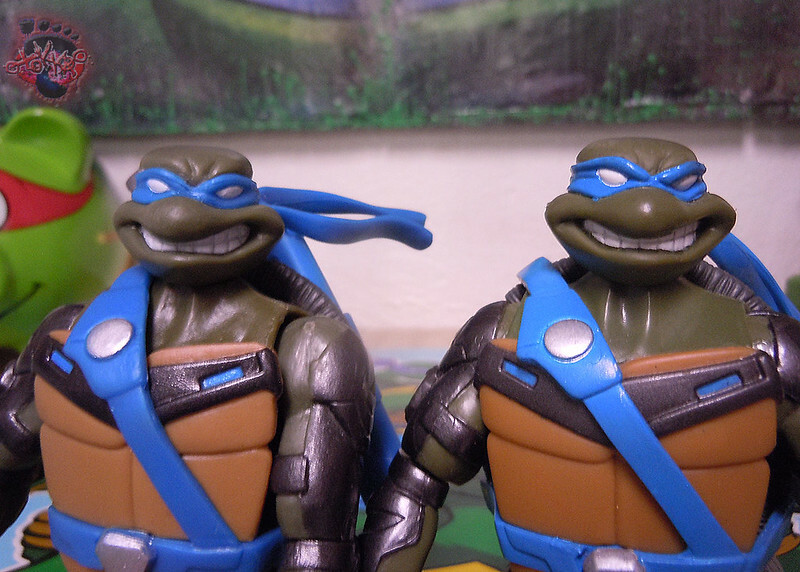 Leo’s eyes on the 2012 were apparently too small so the Varner sculpted noggin has had the eyelets widened to compensate for the pupils on the Playmates touted “NEW DECORATION” Leo version of this figure and the 2015+ reissues. They use the wide-eye head for both versions. Aside fro the noggin’s eye sockets, updated copyright info and threaded foot pegs, all’s in order for this guy. 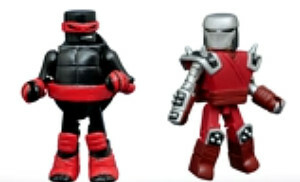 **Last August, Hero reported that the TMNT sidekick 3 pack – Dr. C, Icecream Kitty, and Spike was listed on the TARGET website. If a Target exclusive release or what have you – – these guys still have not come out and have completely been removed from the site itself. ***THEY MAY be in the process of being reworked to distributed at a later date or completely canceled. I’ll try to look into it. 2016 Mega Bloks TMNT Blind Bag Micro Figure Review; WFS, may also have the correct codes / tips for you to help you in your hunt to find EXACTLY which Mini figure you WANT in this review. 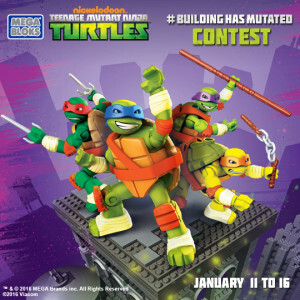 BUILDING HAS MUTATED CONTEST !! FIGURAS TAMAÑO 11 PULGADAS DEL FILM FUERA DE LAS SOMBRAS. 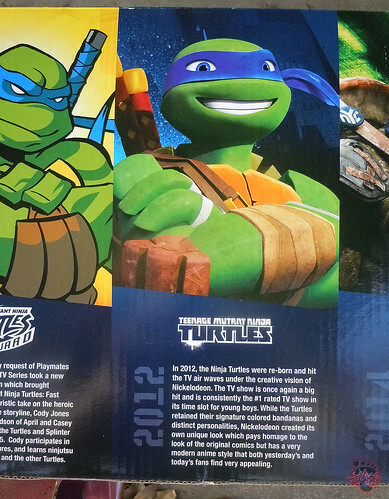 ; DVD comes through again with peeks at the 11″ TMNT2 movie figure line. –>> Part 6 of the GGM “History — Leo” set takes back into the future to about 10 years ago. So prolly more accurately a 2006 year imprint should appear on the back of this box. 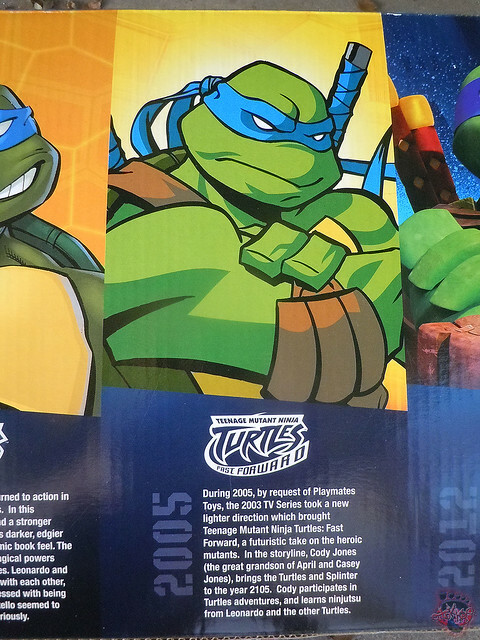 However, the planning for the FAST FORWARD phase of the TMNT 2k3 series prolly started in 2005. This is more Michael Dooney style-guide art printed here – used for earlier on in the 2003 era. But since it’s the same continuity, it does suffice. 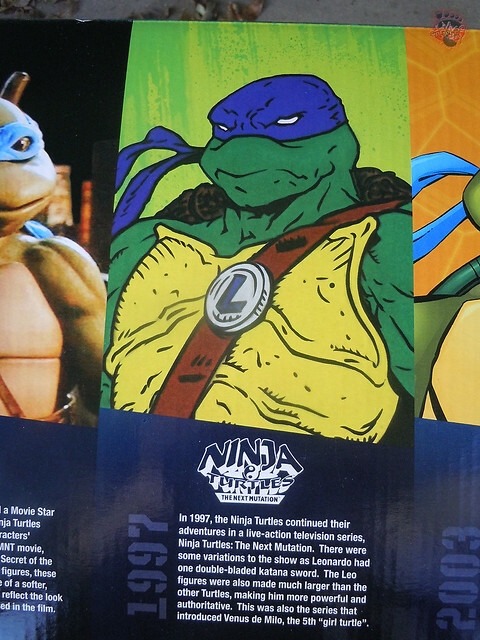 Representing another interesting turning point in the 2003 series as the actually, somewhat short-lived, “futuristic” and lighter TMNT: FAST FORWARD line marked the start of a shift in the Toys and animated worlds of the Turtles. All of this was both praised and shunned by many fans of the show. 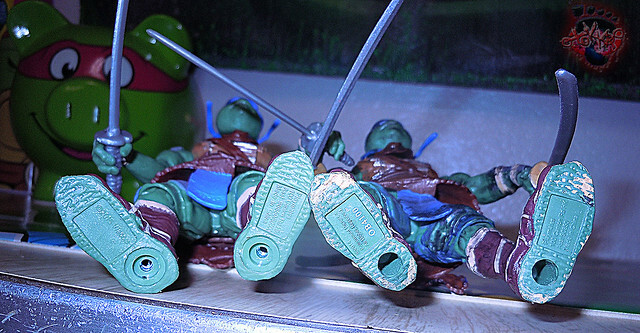 Cut off by the TMNT 2007 film toy line, a whole wave of unreleased characters and fun Turtle variants never made it past TOY FAIR. Another “alright” reproduction – this one was kind of hard to remove from the base. But it may have just been mine. Small paint apps are missing such as below the knee. 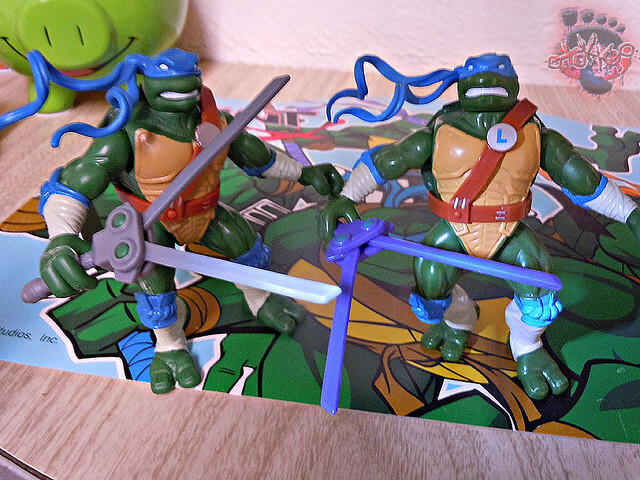 Leo’s futuristic katanas were partly made of a translucent blue plastic with a painted metallic handle ( representing the lazer-like, Lightsabre-ish weapons of the show ). Here they are cast in solid silver. 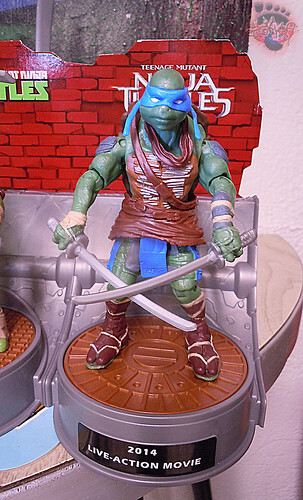 The scabbard on his back is completely blue, the original’s scabbard is silver-metallic. 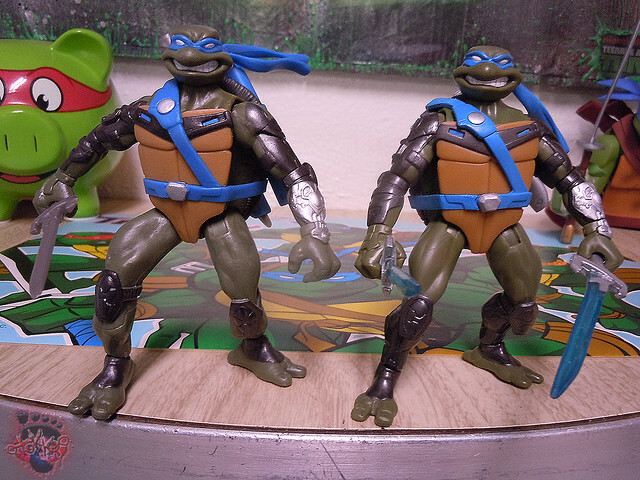 While it may just be MY particular figure, it does appear that the head on my repro FF Leo is just a tad off-mold. As usual, for the set, peg-holes are threaded and copyright info is updated but moved to the lower back of his shell. The noggin, again on my FF Leo reproduction toy seems just slightly off. Not a big deal, but it just doesn’t look 100 % correct. The forehead particularly seems off-mold. Just for fun, here’s DARK LEO. The vile alien Shape-shifter, Sh’Okanabo made evil clones of the Teens to help defeat ’em. 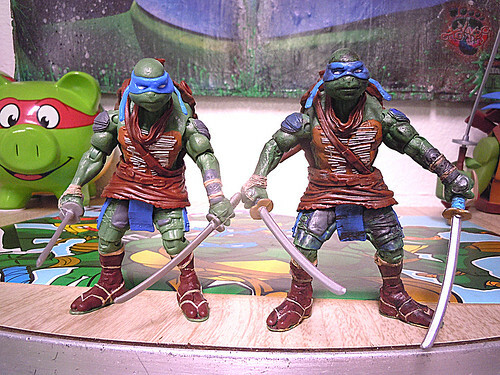 Dark Leo is a particularly effective evil counterpart Ninja Turtle, and he makes a really cool evil Toy. 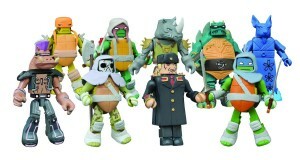 In the latest issue of Clutter Magazine, they have a look at some upcoming Teenage Mutant Ninja Turtles Figures. 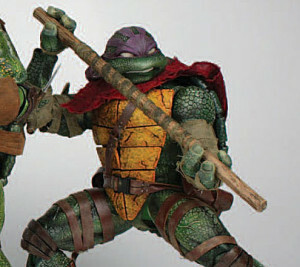 These 1/6 scale figures were designed by TMNT creator Kevin Eastman and will be produced by ThreeZero. We’ve previously seen then base sculpts, but the magazine features our first look at the fully painted and articulated figures. 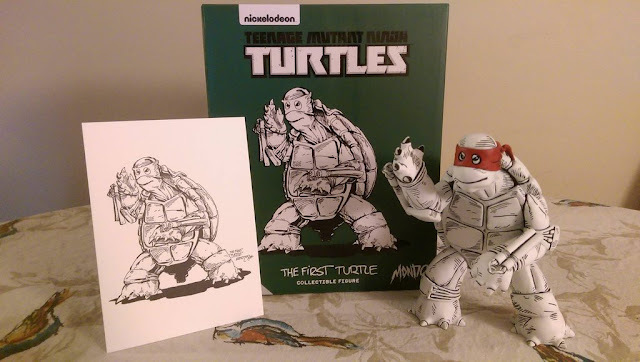 They also have a great interview with both Kevin Eastman and ThreeZero’s Kim Fung Wong about the creation of these newly designed Turtles. In the article, they talk about the future of this line as well. 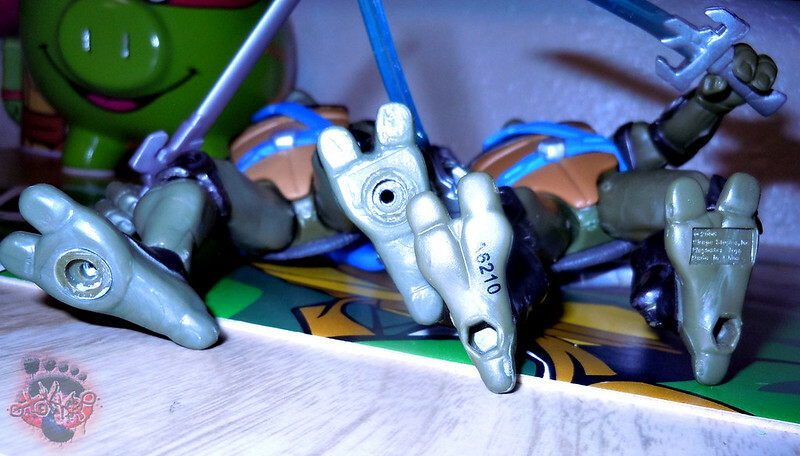 Kevin Eastman mentions he’d specifically like to do a newly designed Casey Jones next, and Kim Fung Wong mentions that they would like to create an entire line well beyond the initial four TMNT figures. 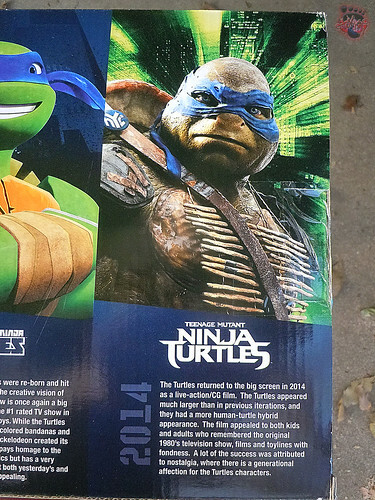 Read on to see the TMNT Figures and you can see the interview Here. LF Garcia’s fan DVD Mock-up. –>> Onto part 5 of GGM’s History – set breakdown. 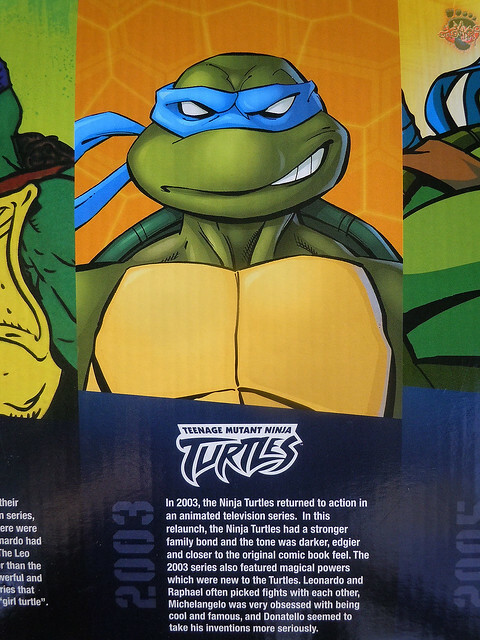 Here, the box art reproduces the initial ’03 card backer art of Leo ( also used on other Playmates and non- products ). That art was used for quite some time. 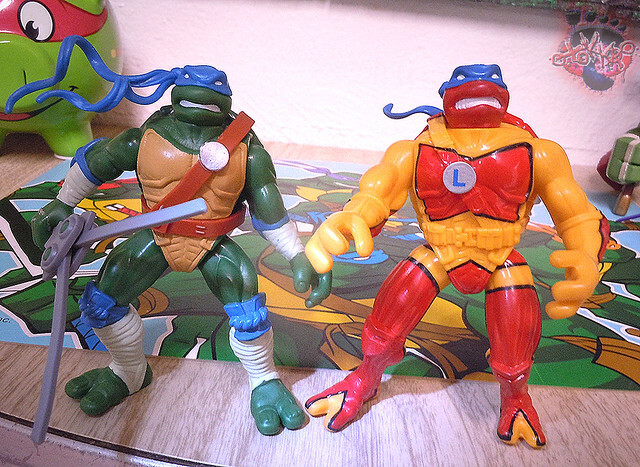 It really matched the look of that first wave Leo. 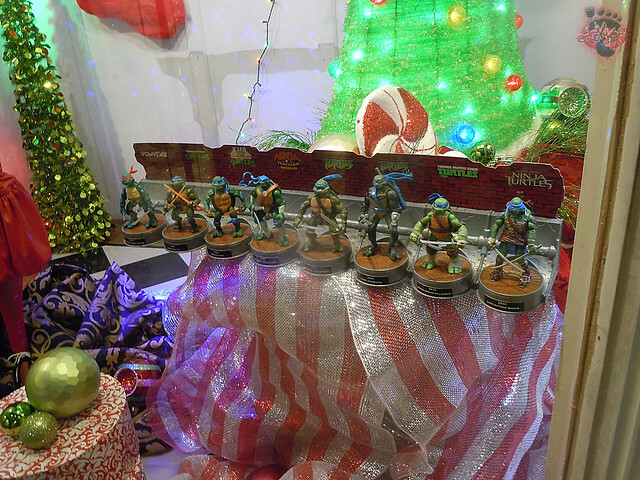 You may still find it here and there on some items like BLUE BUNNY frozen ice cream Ninja Turtle products. 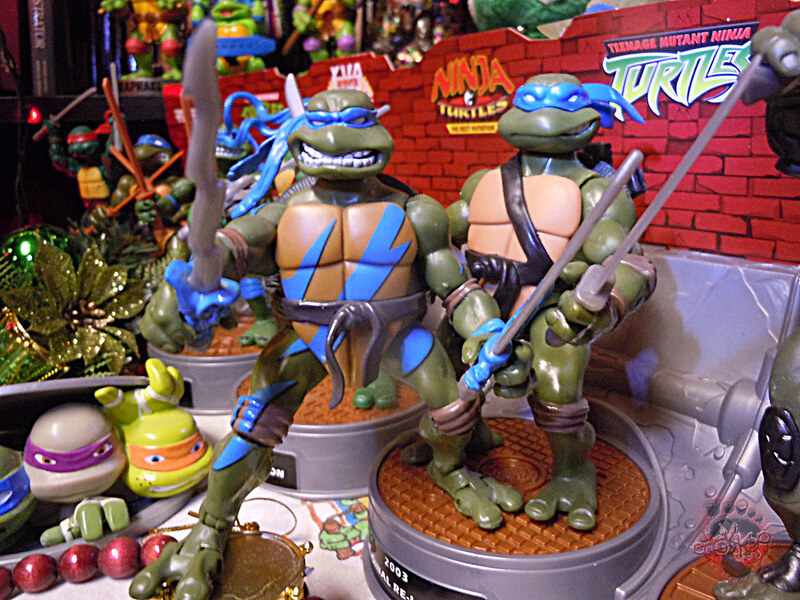 A slightly early, surprise release for the 2002 holiday season at Wal-mart stores ( perhaps others ) of just the Teens to get kids hyped on the then NEW upcoming relaunch Turtles show brought the original intro of this sculpt. 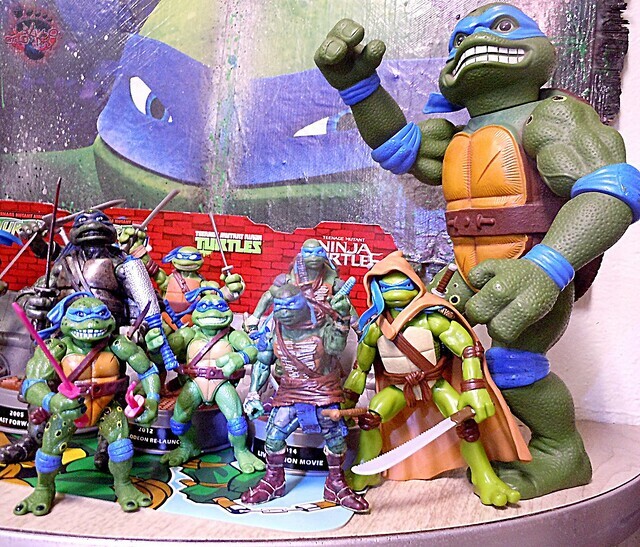 Arguably, that original wave of TMNT ’03 figures was some of the strongest product PLAYMATES ever produced. With the Teens and supporting cast featuring newer articulation not seen in TMNT toys before, great detailing and washes on the paint schemes, and notable actual paint on the weapons themselves — Playmates & 4kids wanted fans to know that these Teens meant business !! In the budget cutting age of Playmates with minimal, weird, questionable, or NO paint decos on retail figures – this guy translates “OK” in this set. 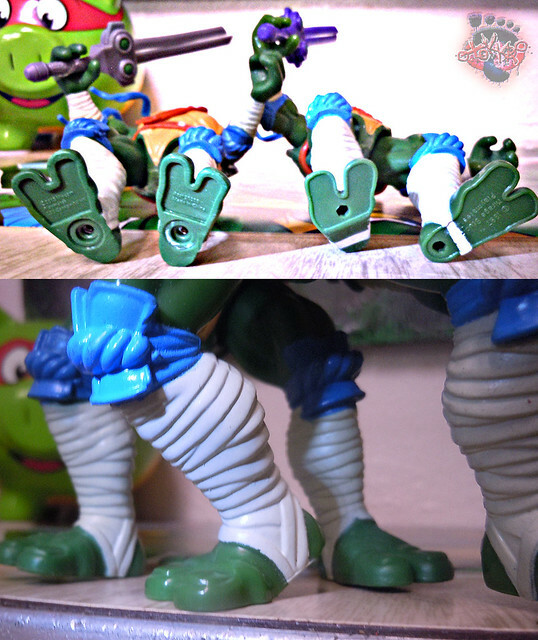 Another stabilization modification is made to the left leg this time on the toy giving his foot and lower leg a slightly less ‘bent’ stance compared to the original. The newer stance is a bit more rounded and stable and looks cool. The belt, scabbard, & swords go unpainted this time so no real details except for the sculpt itself. The body gets only the basic paint and NO paint washes or detailing. The plastron chest-piece on the ’02 toy is a bit softer and you can actually press it in a little bit. The chest-piece on this reproduction is entirely solid. Non-pliable whatsoever. This repro is still pretty adequate a representation of the ’03 figure. 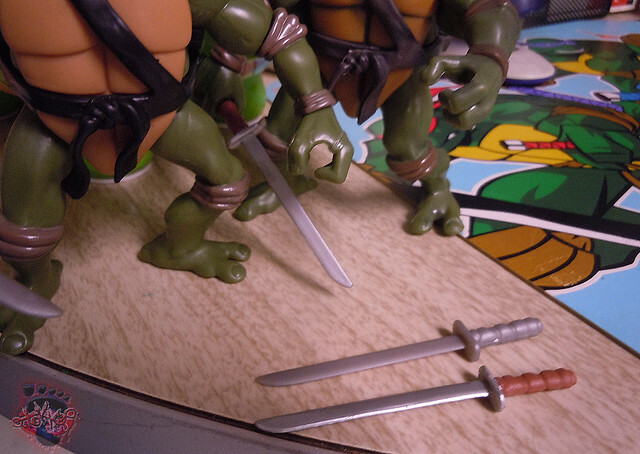 Threaded feed again on the repro, and his unpainted swords also seem a tad smaller than the original releases. The updated copyright info is transferred from his left to right foot. 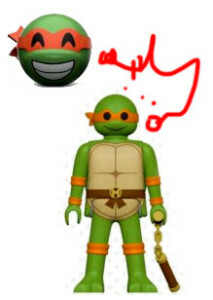 .. for fun, we get a visit from my favouriie ’03 era LEONARDO, MYSTIC FURY LEO !! ..and the original ’06 F.F. Leo steps up to visit the set !! 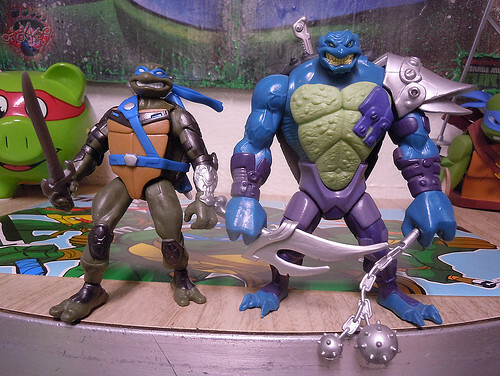 TLS x TMNT2 – Wave 2, Teenage Mutant Ninja Turtles animated series inspired Action Vinyls. Includes more accessories, killer poseability, the best villains, our lovable heroes and extremely hard to find chase figures! These Action Vinyls stand 3.25′ tall but pack a mean punch! Shipping first week of March, 2016. 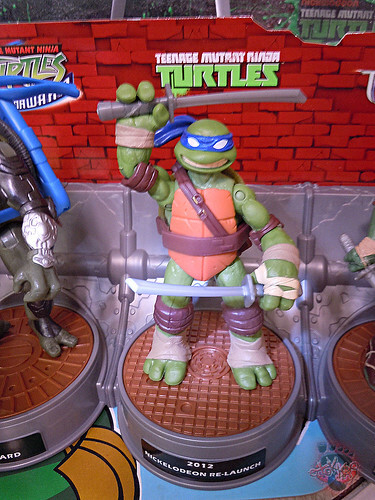 **Dakota reports in that the TMNT official toy site has been updated yet again for early 2016 with images of H.S.H. 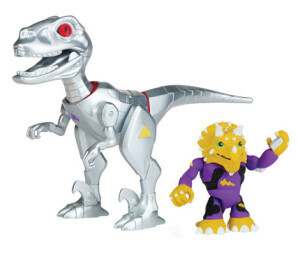 Robo-Raptor with Triceraton & updated images of the Battle Dino ( the actual Dino’s in the Nick Special ) sets with their Turtles. 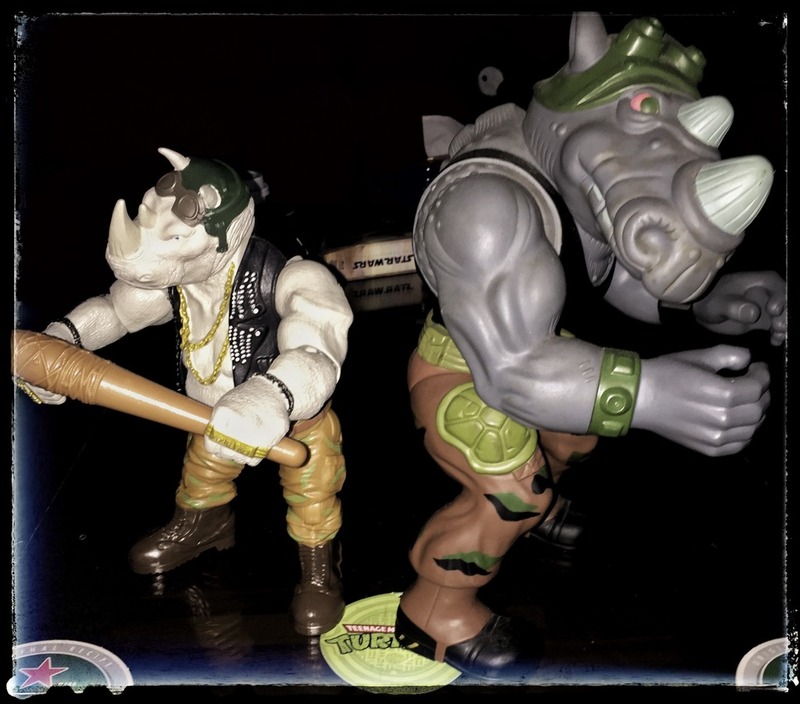 ***Dino Bebop, Rocksteady ( with their own Dino buddies ) , Splinter, and Shredder. ..I’ve not aggregated on the comic front in a few months, and i will try to change that in coming posts. Part of this is due to Tokka’s personal issues with comic companies that has interfered with life/ career issues rather drastically. Posting IDW related news items did become a sticking point. However as to not let bias come into play while posting on GGM, i’ll have to get over this. This was an important decision ( made long ago ) to make on relaying the news as UN-biased as possible to let the fans draw their own conclusions on issues and matters at hand in regards to books, films, media, whatnot. 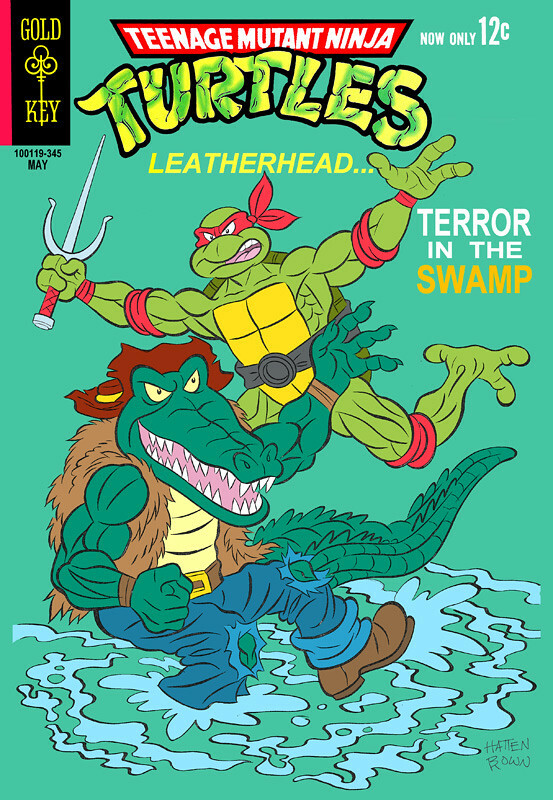 There’s one “lost” post not published in regards to Ryan Brown’s return to at least some semblance of comic work with the Lavigne penciled cover and Ryan inked **TMNT Adventures Archives Vol.10. While i cannot promise what i will propose here will happen, i will try. Within’ publishing the lost post, i will gently request a Q & A with Ryan of some sorts. For years now i am infrequently bombarded with questions i cannot always answer i.e. : The collapse of Ryan Brown’s “THE SELECTED” Mutanimals Revision / spin-off comic, The cult favourite WILD WEST C.O.W. 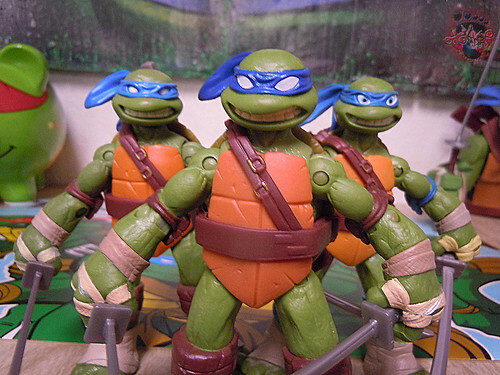 Boys of Moo Mesa, his creations : Mondo Gecko, Leatherhead, and Slash and general input on Ciro and Nick’s ( and possibly IDW’s ) direction with the original SPIN-OFF team of Turtles – the MIGHTY MUTANIMALS. Ryan’s very reserved and may not be up to this. So i cannot promise sh**. 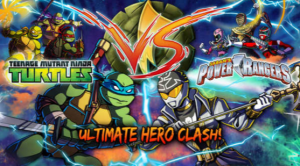 But he’s a legendary TMNT creator and writer who gets MINIMAL credit and goes heavily under-appreciated in many fan circles. I also cannot guarantee that will change. But his fans DO want to hear from him. And perhaps a short Question and Answer session may be in order. We’ll see, bare with me as i look into this. –>> Classic Michael Dooney N.M. style-guide art on the back of the box.. Modifications on this reproduction aren’t too bad. The right foot has been modified to set FLAT on the ground. Possibly again for stability reasons on the display stand. He may stand better than the original release actually. I am fond of the new stance. So his feet are a little “bigger”. The Dual-Action Katana is recoloured from vintage releases but actually looks really good. The belt strangely has just a silver medallion where an “L” initial used to be on the ’97 release. The “L” imprint is actually still there, but it almost looks painted over by the silver paint. You can barely see it under the metallic. Like the vintage MOVIE STARS, the N.M. Turtle’s arms, head and legs had softer and rubbery plastics. The only soft part left is the bandanna piece on the back of the noggin. 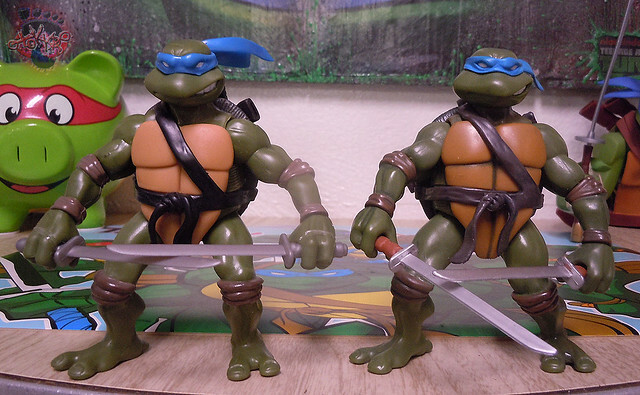 ..Leo’s original sculpt is in the forefront, you can see the “BATTLE STANCE” has been modification on the repro. 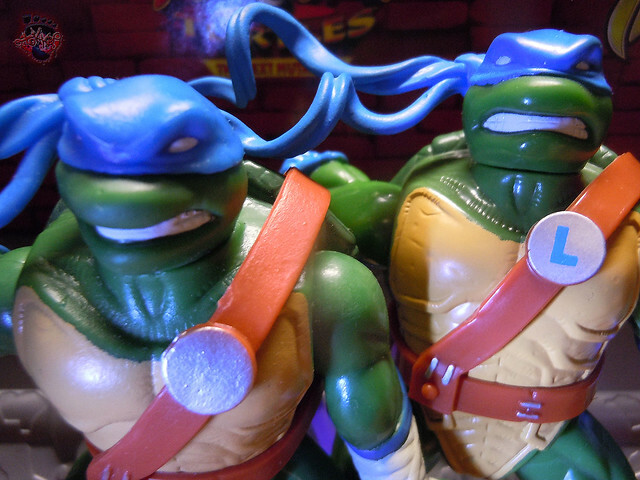 ..look closely at the Repro’s belt, see the “L” initial ?? Strange. 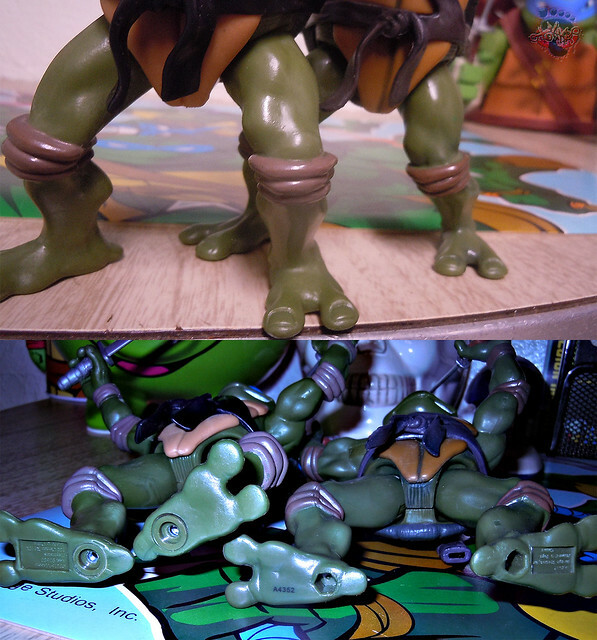 ..for fun, here’s Repro LEO with the Camo-Blitz Cycle ’98 release. A Diamond Select Release! 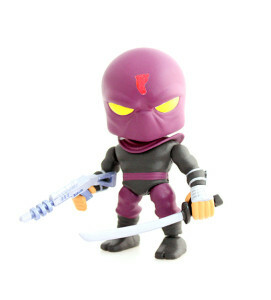 TMNT fans are loving DST’s line of Ninja Turtle Minimates, and Series 3 kicks things up a notch! Featuring the four turtles in their Vision Quest outfits, this individually foil-bagged assortment also expands on the line’s mutant roster, with Slash, Bebop and Rocksteady, as well as rare, one-per-case figures of Ivan Steranko and Vision Quest Splinter! Each 2-inch Minimates mini-figure has up to 14 points of articulation and features fully interchangeable parts and accessories. Each full-color counter display contains 18 foil-bagged Minimates, including a full set of all nine characters! Designed by Art Asylum! 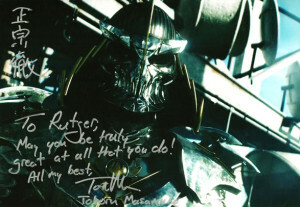 Rutger’s TMNT Autograph Collection :: NEW SITE ! !